every afternoon the same thing happens. i get hungry. and since it feels like i’ve spent the whole morning & early afternoon cleaning up after breakfast and lunch and generally spending 95% of my time in the kitchen, i’m really not looking for a snack that requires me to “make” something per se, nor one that creates very many dirty dishes. so something chocolate is usually my go-to. keeping that in mind, the other day i went to costco and found a great deal on greek yogurt, not realizing that it was…plain. boo. i don’t like plain yogurt – it’s gotta have some flavor for me, whether it’s some kind of fruit, or honey, or whatever. so when i realized this mistake, i was looking through my fridge and freezer looking for something i could add to this plain yogurt to help me be able to eat it. and then i saw it, and it made perfect sense…jam. homemade peach jam, to be specific. brilliant. 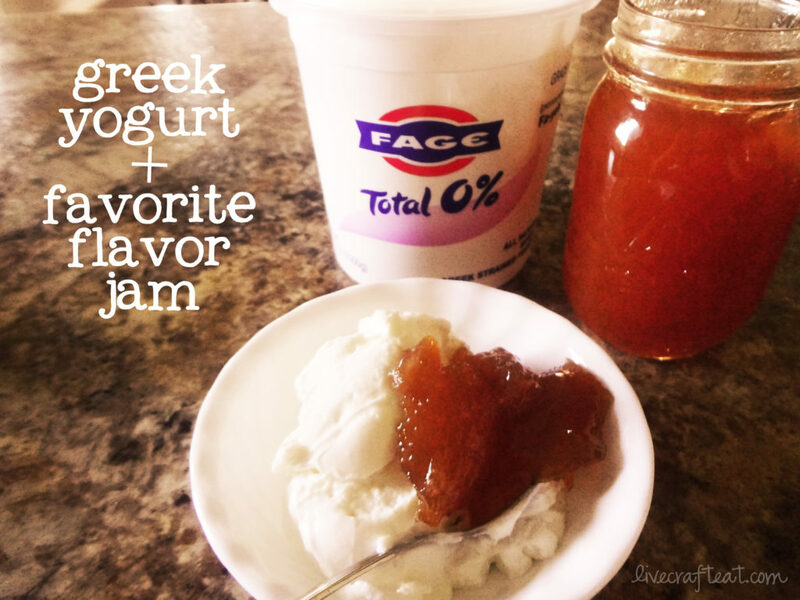 so i got out a little bowl, poured in some of this plain greek yogurt and added a couple spoonfuls of the peach jam. stirred it all together, and the result? my new favorite go-to, one-dish, easy-clean-up afternoon snack! sometimes things that seem like mistakes can turn out to be a good thing after all! 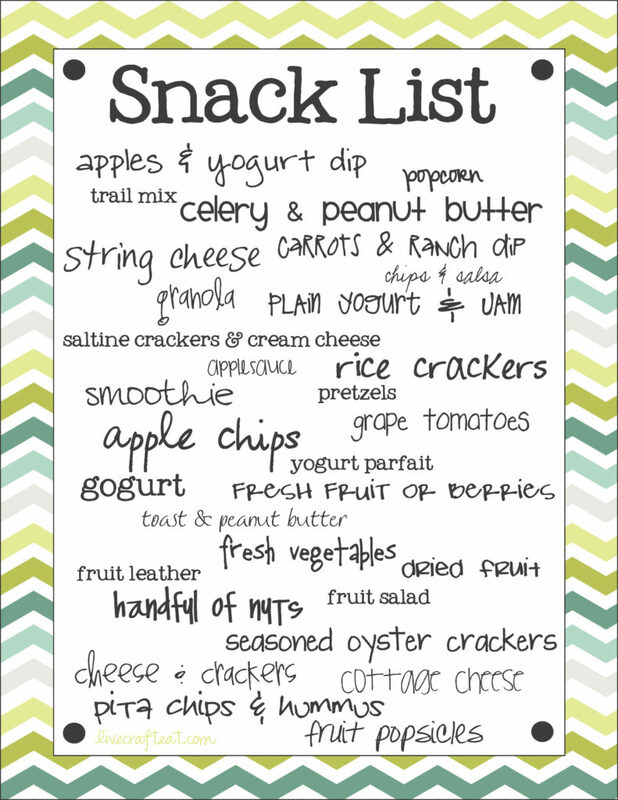 along with this new fav, i’ve posted a printable snack list, below. these are some of my other favorite (healthy) afternoon snacks, just in case you find yourself in the same boat as me and need a couple ideas of healthy snacks when that afternoon chocolate craving comes on. this list stays on my freezer door, so instead of reaching for the ice cream i stop and realize just how many other easy and better-for-me snacks i can have! 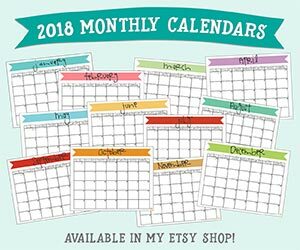 you could even laminate it or put it in a page protector and circle the ones that you have items on hand for that week with a dry-erase crayon or marker. you can download the printable (healthy) snack list here. 1. apples and yogurt dip: my kids love when i give them apple slices and strawberry-banana yogurt as a snack. both are healthy and taste great together! 2. trail mix: you can buy trail mix almost anywhere – grocery stores, costco, etc. or you can make homemade – mix in your favorite dried fruits (like craisins, golden raisins), seeds (like sunflower seeds or natural raw pumpkin seeds), and your favorite nuts. i love almonds. 3. chips and salsa: i’ll be posting a yummy homemade salsa in a few days the we’ve been canning the past few years. you can make it as hot or as mild as you like. we love it! so stay tuned! 4. saltine crackers and cream cheese: this used to be my favorite snack when i was a teenager. 5. yogurt parfait: just layer vanilla yogurt, some fresh or frozen berries, more yogurt, and top if off with some granola! simple and delicious. and, by the way, “parfait” means “perfect” in french. can’t go wrong there! 7. seasoned oyster crackers: these are so, so good!! you must try them. plus, they’re ridiculously easy to make. here’s the link for them: homemade seasoned oyster crackers. oh, and don’t worry – they have nothing to do with oysters! hope you enjoy eating a yummy and healthy snack this afternoon!! Thanks so much for that snack printable. I always seem to be able to think of lots of snack ideas until I’m actually getting a snack. I love the idea to have a printable on my fridge to remind me of snack ideas. Thanks so much!